Dan began broadcasting in 2003, creating and running "MU Courtside" at his alma mater of Marywood University, serving as Head Commentator covering the NCAA Men's & Women's Basketball Division III teams while also bringing the program to life with the original logo, graphics, & setup. He remained in the role of the student-run program his entire four-year collegiate career. From there, "The Dan Tortora Show" was born, with Dan broadcasting on ESPN Radio affiliates in Scranton, PA, Syracuse, NY, & Orlando, FL. 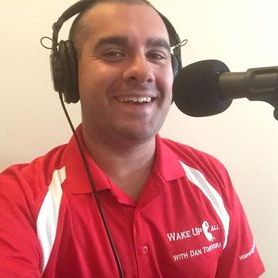 "The Dan Tortora Show" morphed into "Wake Up Call with Dan Tortora", which Dan first aired on The Score 1260 before beginning his own company, Dan Tortora Broadcast Media, LLC. WakeUpCallDT.com is now the hub of Dan's coverage of the sports & sports figures we love, bringing his unique shows, videos, & articles all to one place! Listen, Watch, Read, Enjoy Here "Where Sports Meets Life"!